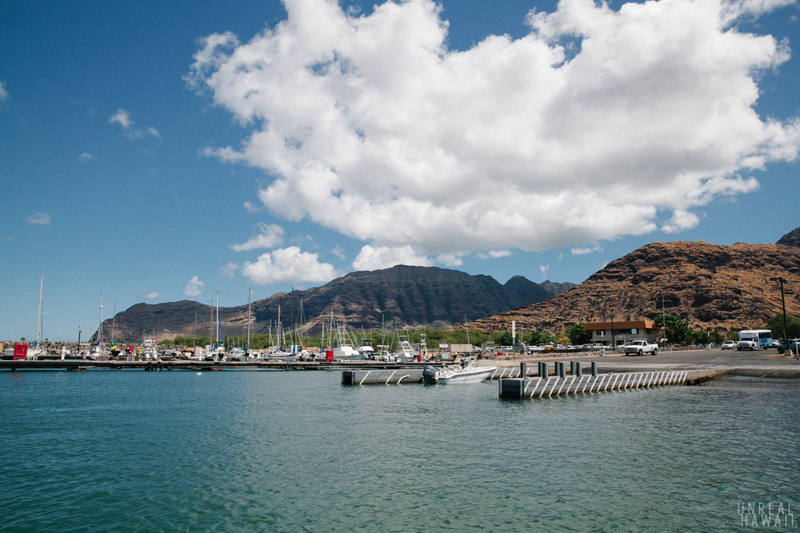 Waianae Boat Harbor, a long ways from Town. 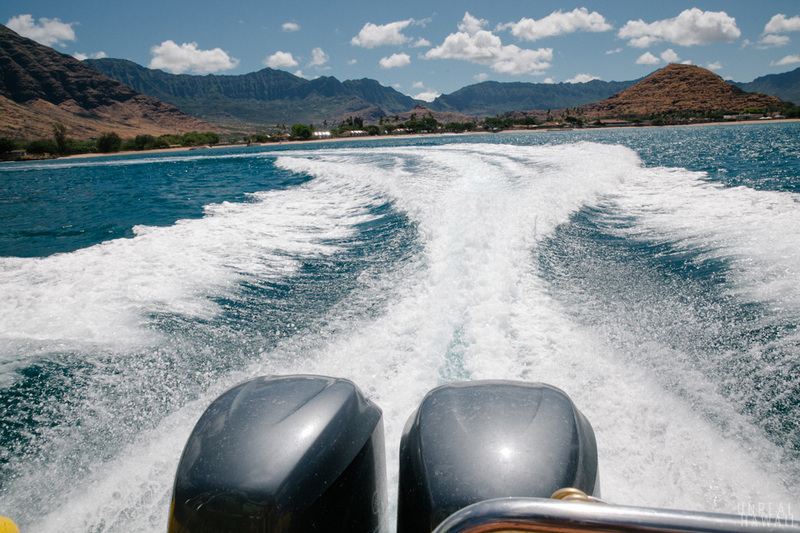 You jump on a boat and they speed you up the coastline past Makaha. You’re with a bunch of other people, mostly tourists. 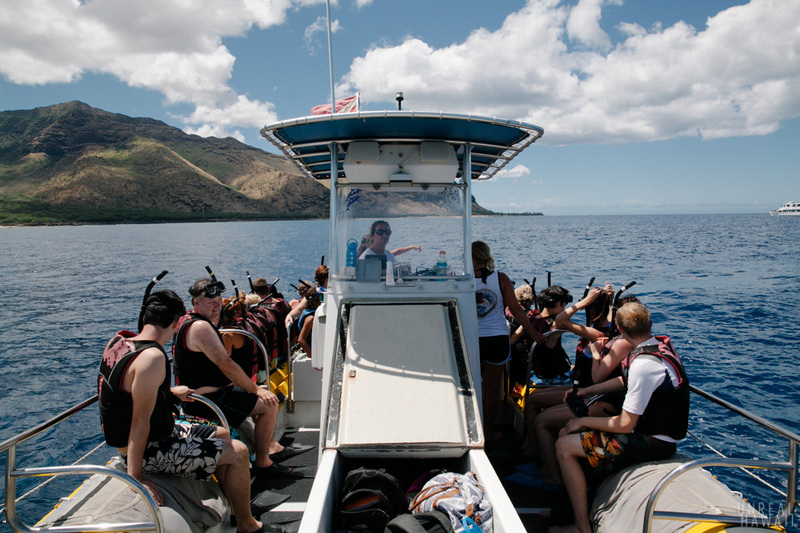 The captain and crew give you the low down of what to expect and what you are supposed to do. 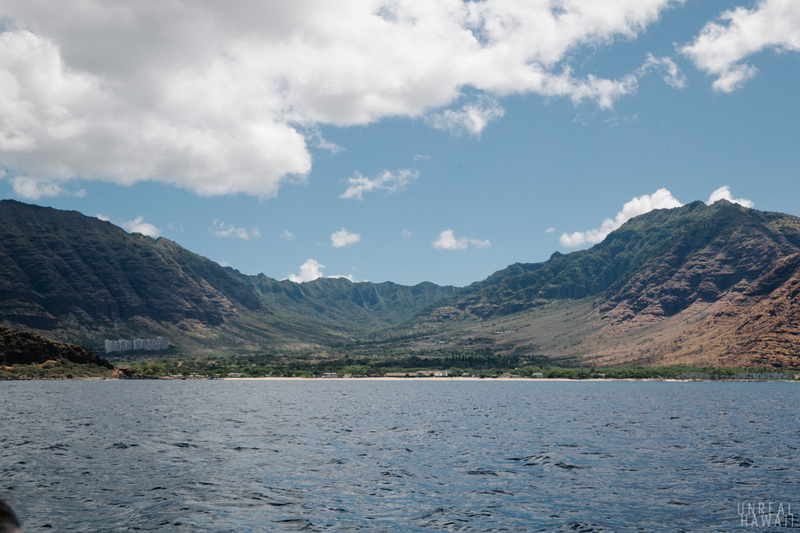 The views I’m used to on Oahu’s westside are from up on the mountains looking out to the ocean. Today was the opposite. 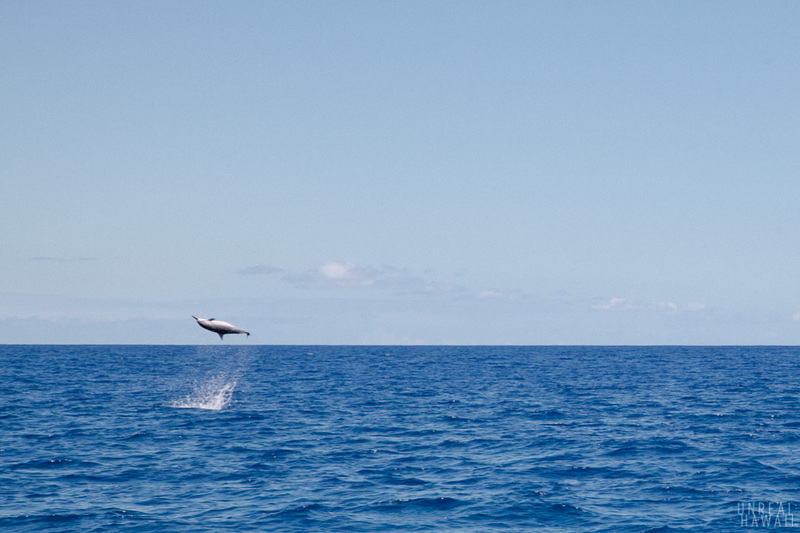 Today was the day we saw wild dolphins. They were right next to us. Or, rather, we were right next to them. 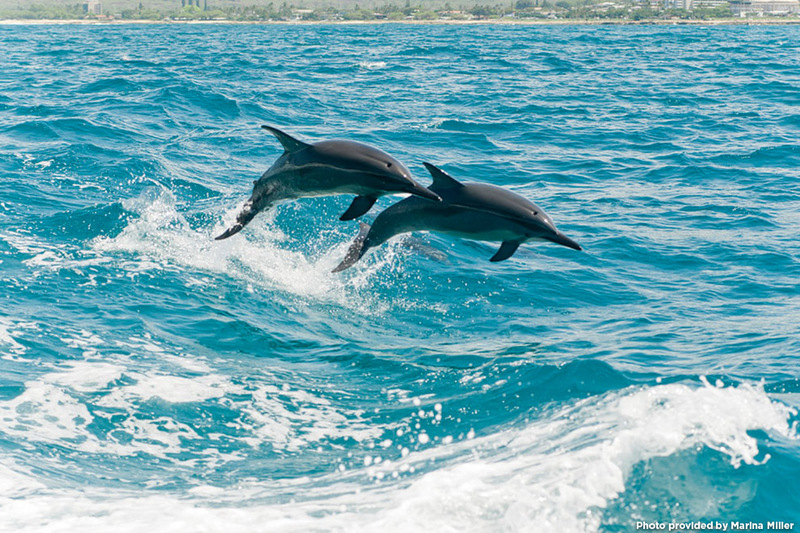 These waters are home to Spinner Dolphins. For some unknown reason, they jump up in the air and spin. They were doing this all over the place. On this day, there was a huge pod traveling up and down the coast. 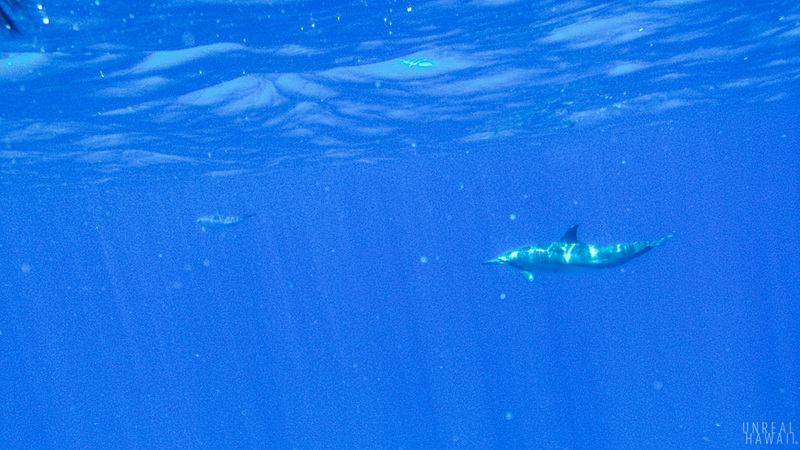 They are out in deeper waters feeding at night and during the day they come here to cruise and rest. 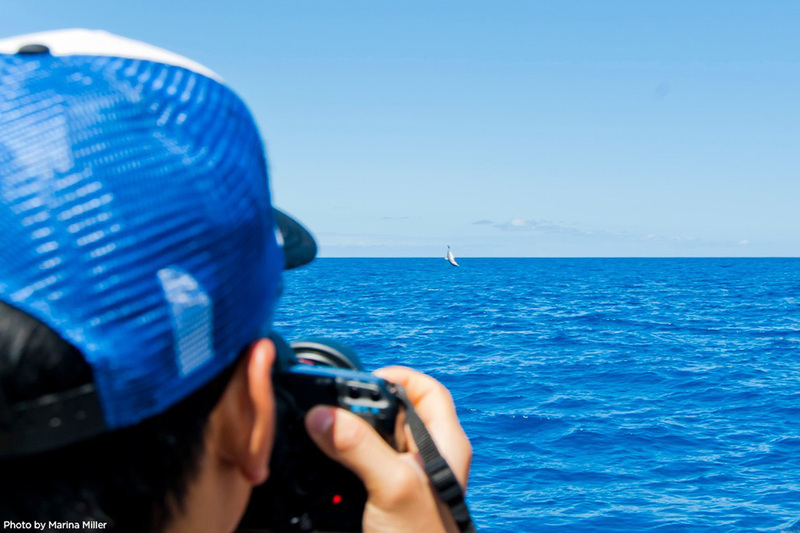 When dolphins are spotted the boat stops. 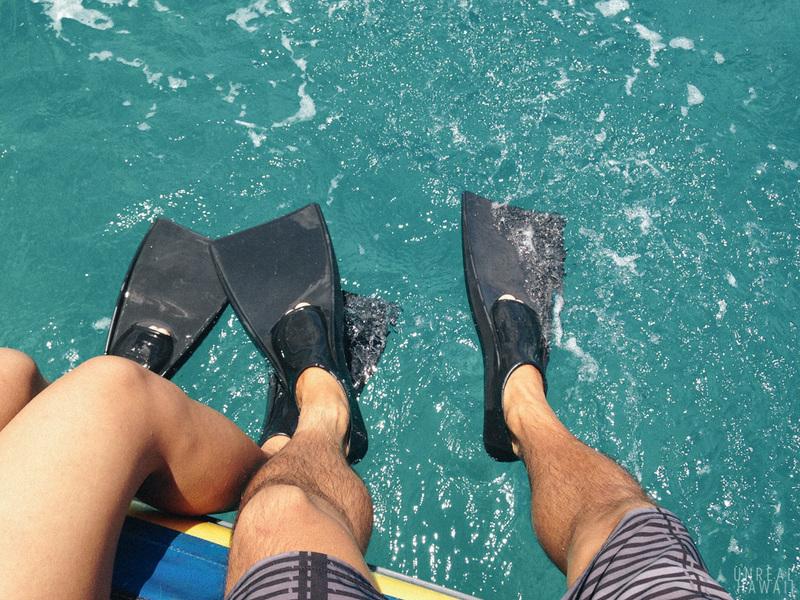 You put on your stylish life vest and fancy snorkel gear. You jump off the boat and enter the water feeling supremely dorky. You wish you could swim freely without the vest and without all these other people around you. 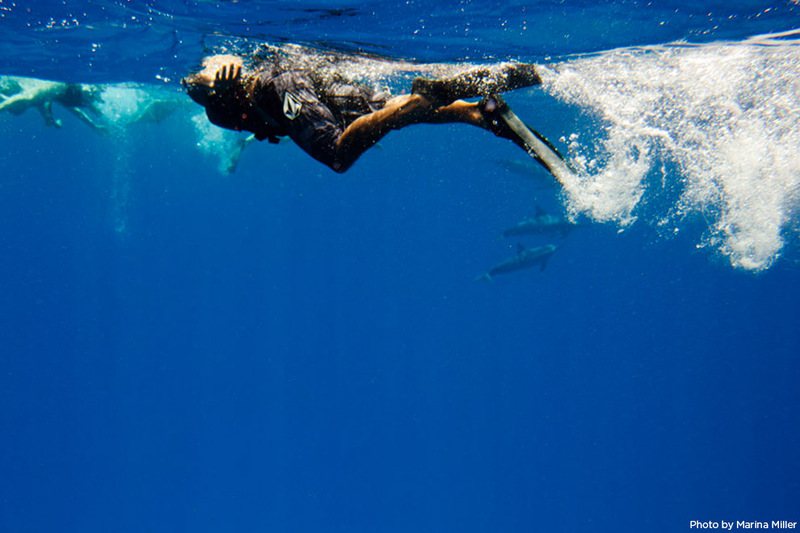 But, the fact of the matter is, this is the safest and most practical way to see dolphins in the wild. 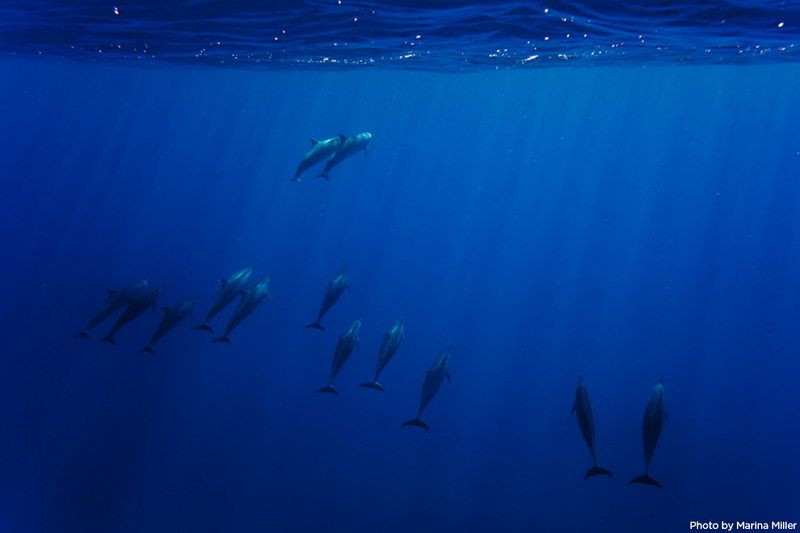 The dork factor is completely erased from your mind though when you look down and see dolphins swim under you. This is what I saw that day. 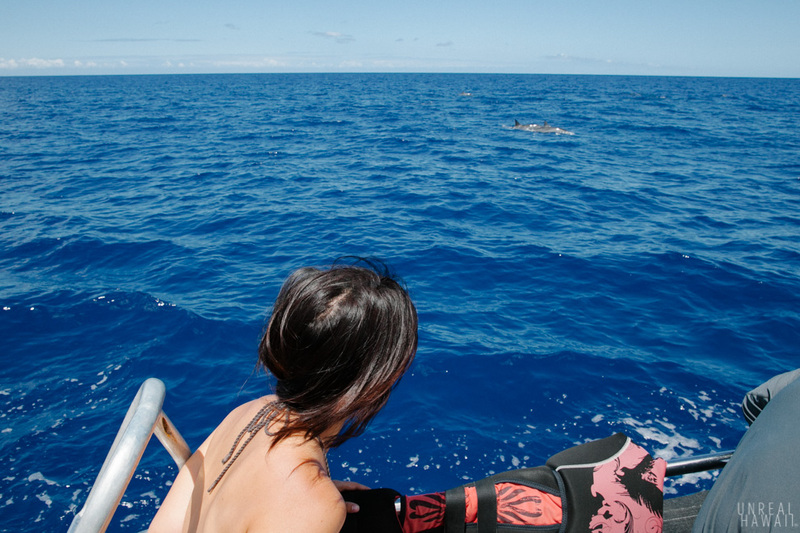 I jumped in the water, swam to the back of the boat, looked down and saw some 30 dolphins under me. 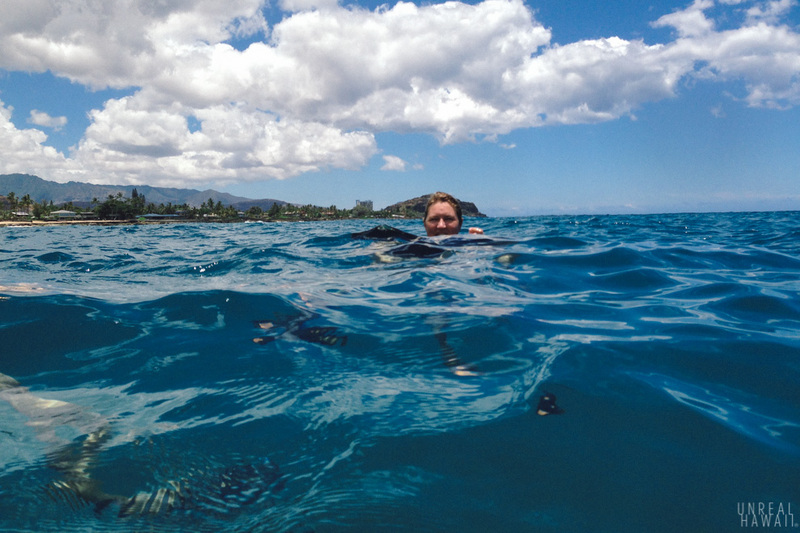 I had my iPhone in a waterproof housing (Watershot for iPhone 5) and took a bunch of photos. 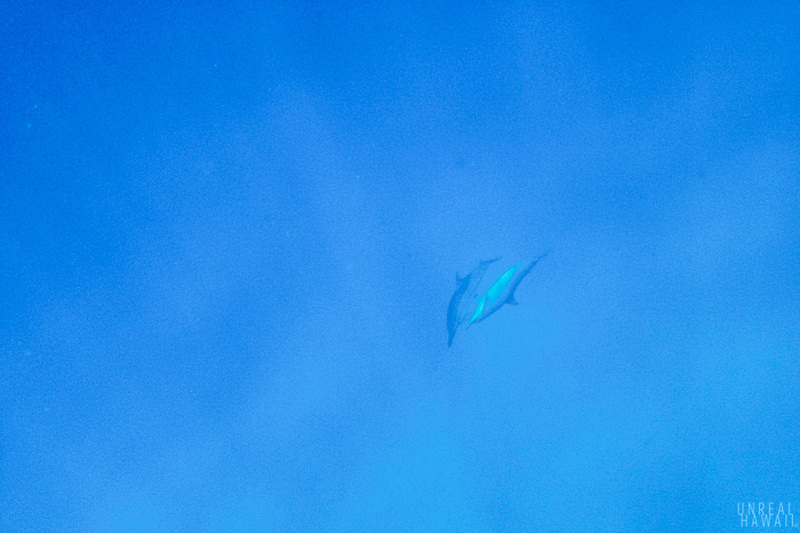 The dolphins were swimming some 20 feet below us. 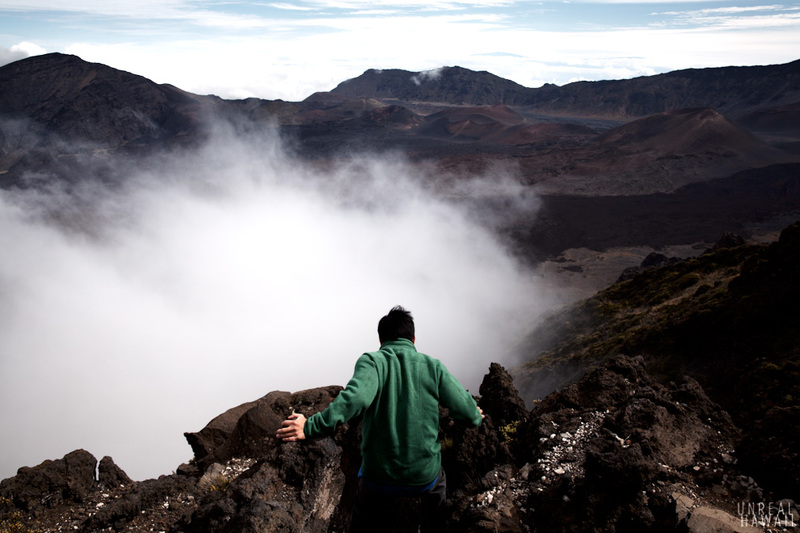 It was one of the most amazing things I’ve ever seen in the great outdoors. Some dolphins were swimming slow (resting), some were swimming fast, some were upside down, some were adults, some were babies and some were making babies. 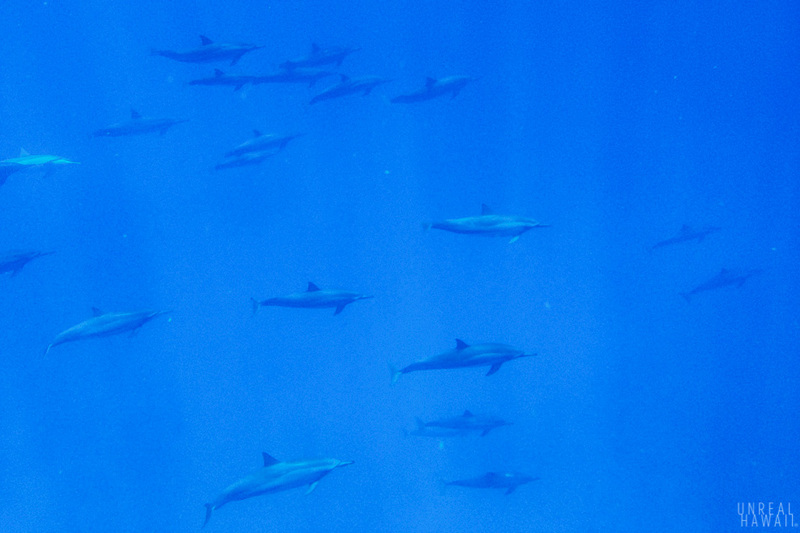 A few dolphins flew by close to the surface. They zoomed right in front of us. 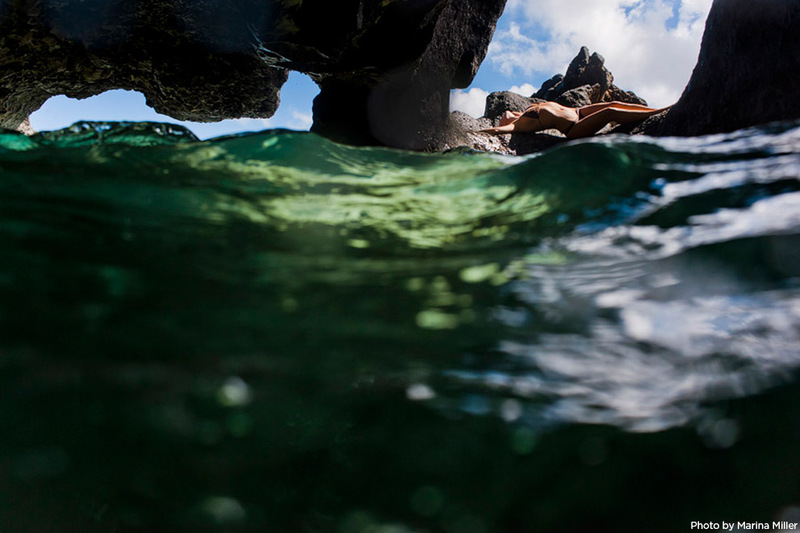 Unless you have a big old DSLR in a very expensive water housing, your photos will probably come out crappy like mine. But that’s where our photographer Marina Miller (pictured above) comes in. Marina works for the dolphin tour and is available to take photos of you and document the trip with her professional grade equipment. Marina was kind enough to send me some photos from our tour and from some other outings. A dolphin and her calf. My iPhone photos didn’t do the view justice. 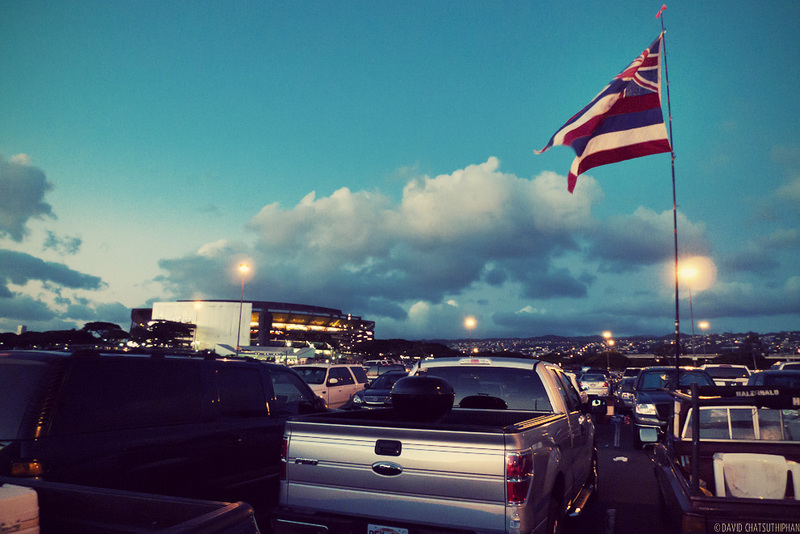 This photo, from Marina’s camera, is a better representation of how the scene looks in real life. If you think this photo is magical, imagine seeing it in person. 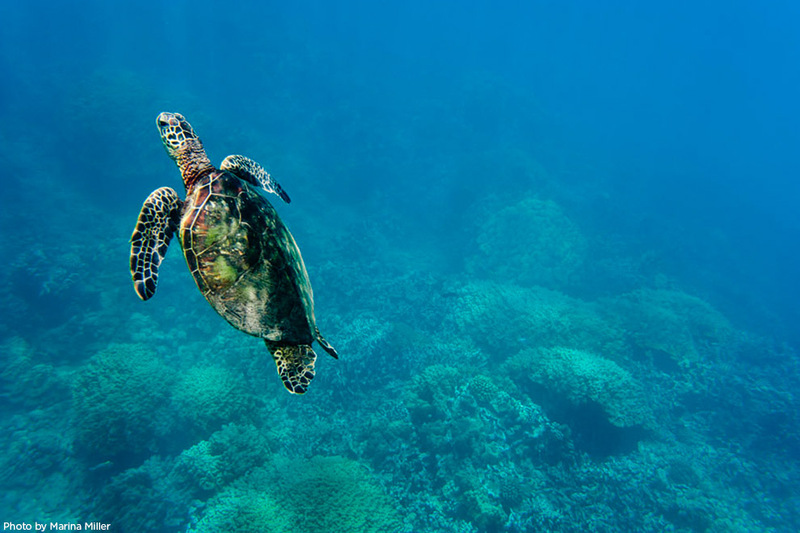 There’s more wildlife in the ocean than just dolphins and us tourists though. 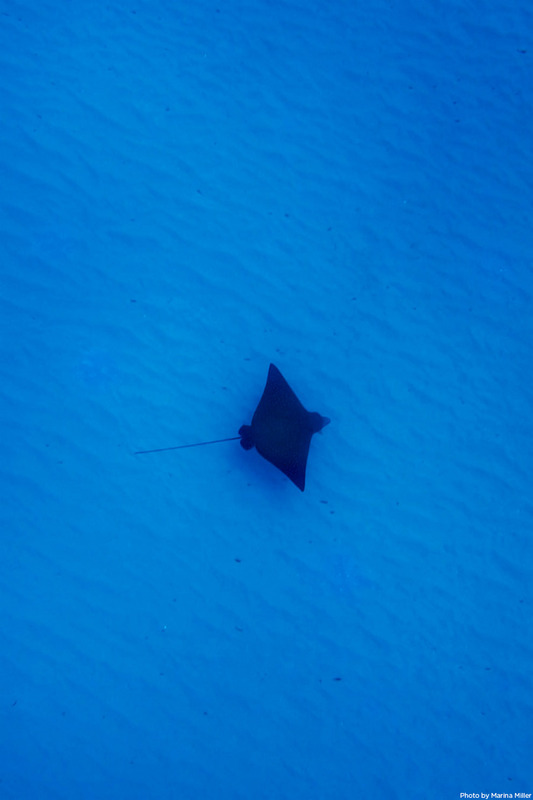 We saw this eagle ray that day. Marina took a drop and got this shot. 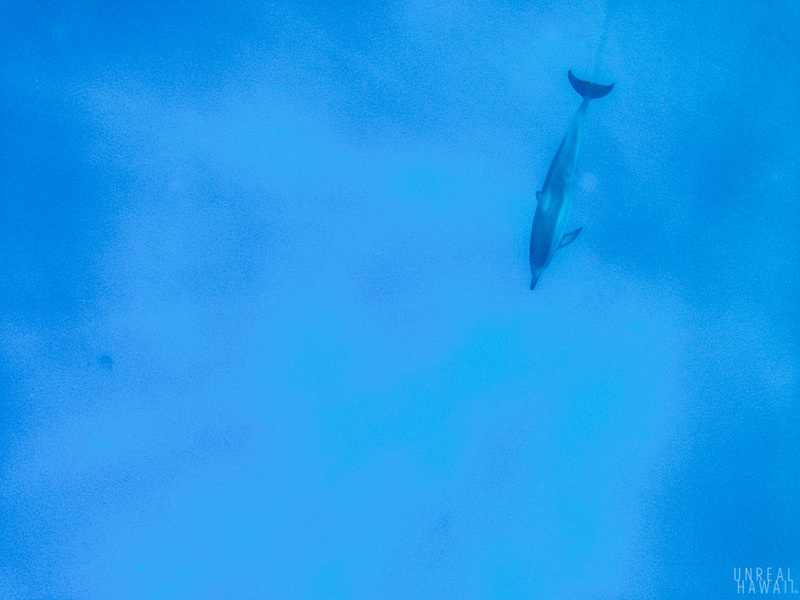 Our marine biologist guide on board took a drop too and did a little free diving. 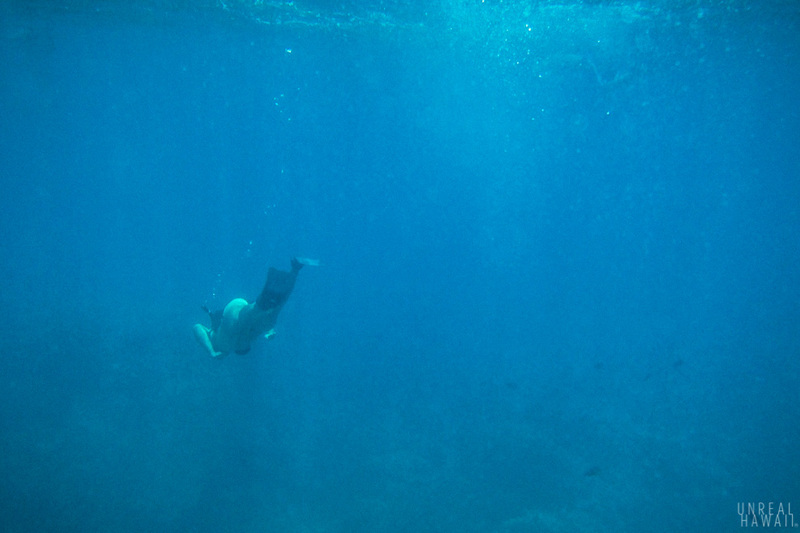 The ocean floor is about 90 feet deep over here. 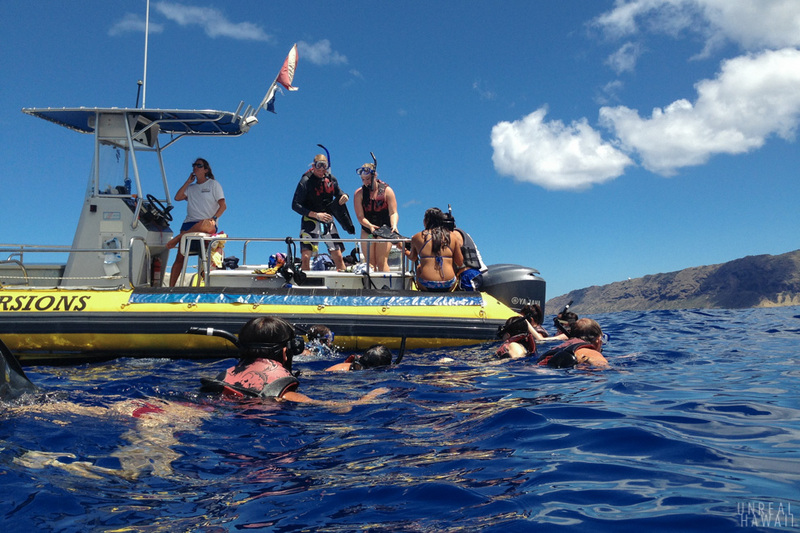 After the dolphins had passed us, the tour continued to a snorkeling spot on the west side. We jumped off the boat again and got in the water. I pulled out my iPhone and tried to take more underwater photos. 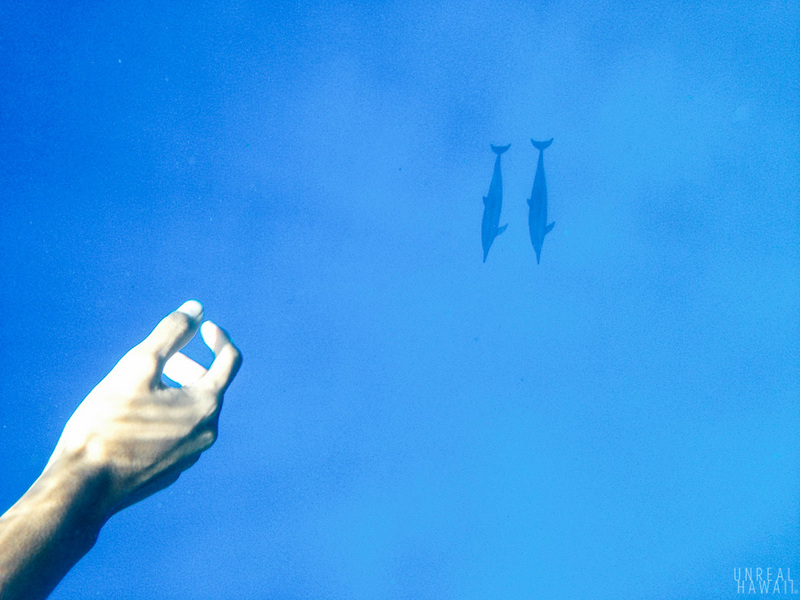 This area has clear blue water and is full of fish. 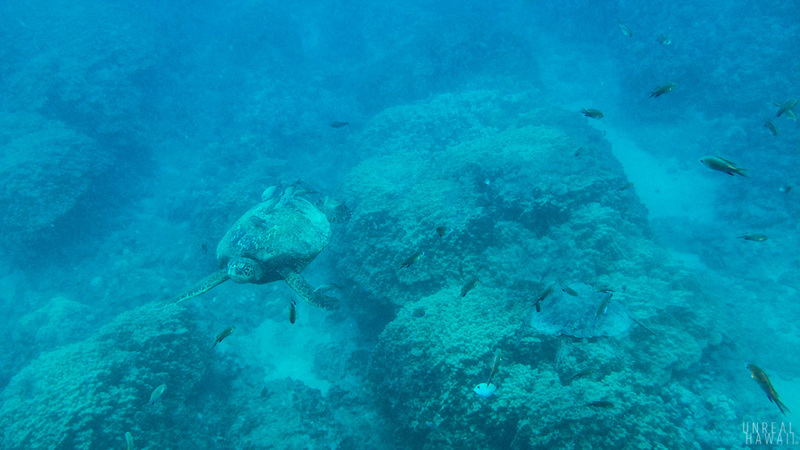 Honu also frequent this place. 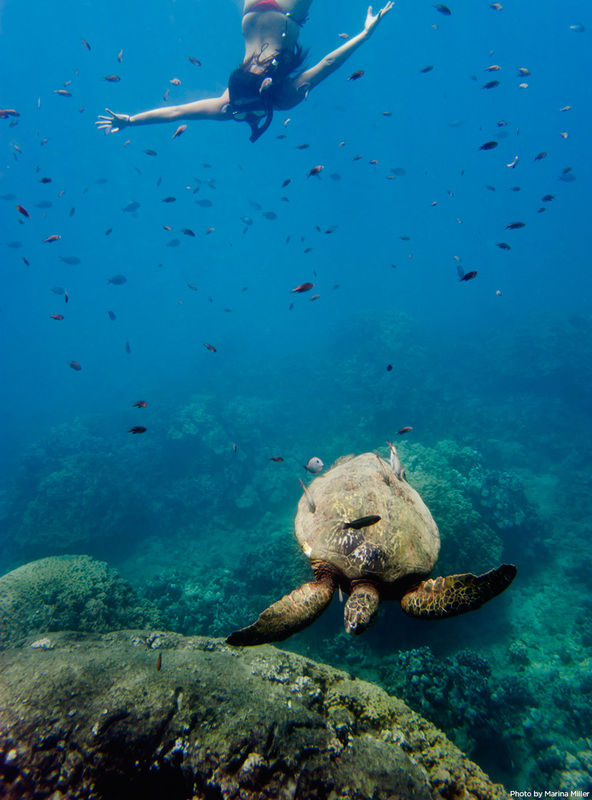 There are two honu in this photo. They’ll swim right up to you but don’t touch them. They are protected creatures and you can get fined for touching or pestering them. 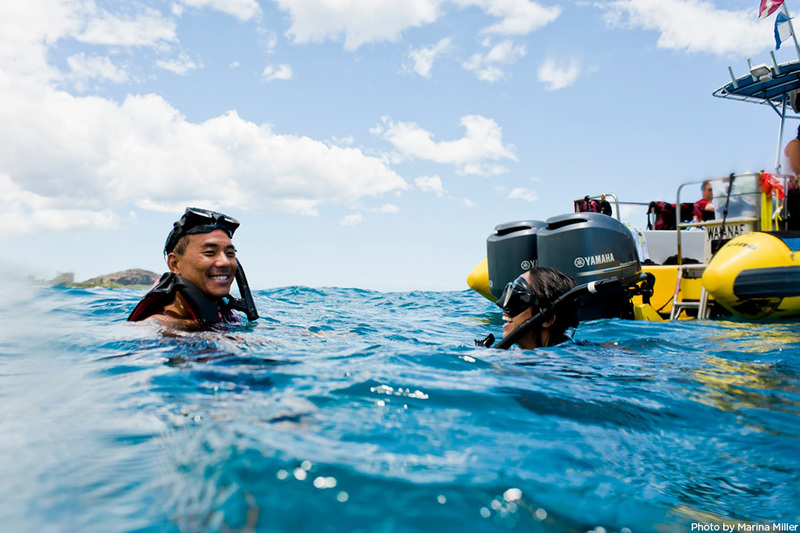 Marina is available to take your photo as you’re snorkeling as well. I think you can see, her photos came out looking slightly better than mine. The honu shell just glows with color when the sun hits it. This tour put a big goofy smile on my face. Now, I’d like to share a few more of Marina Miller’s photos. 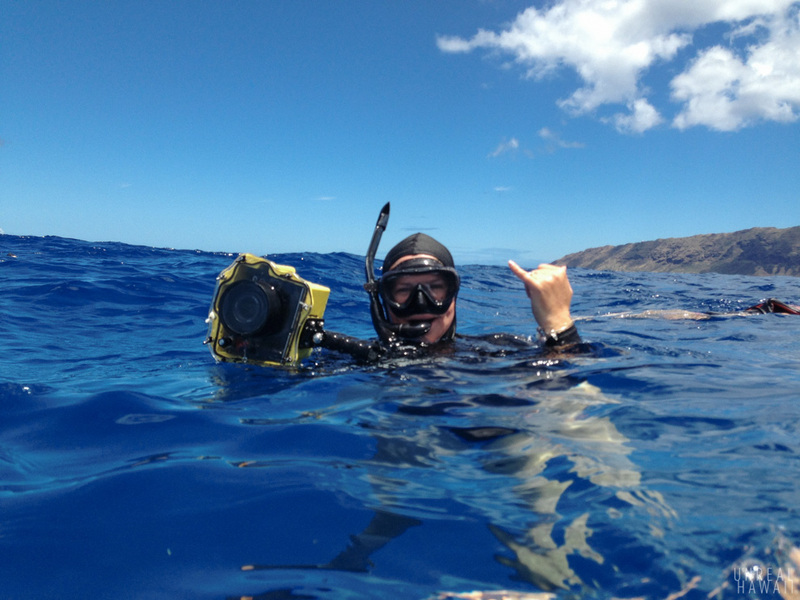 She’s a local, Oahu-based, professional photographer that focuses on underwater photography. 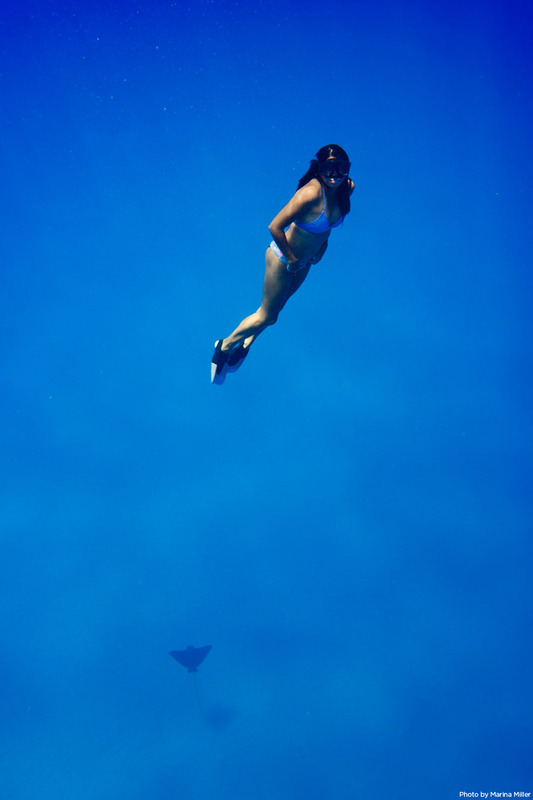 She has a bunch of incredible dolphin shots but that’s not exactly her specialty. Marina mostly takes photos of people. Her work is super stylish and her compositions are totally unique. Marina lately has been doing “mermaiding” sessions where she’ll take underwater photos for girls. Engagement photos, weddings, trash-the-dress, and family sessions are available as well. You can learn more about Marina Miller, see here work and learn how to book a photo session on her website: www.redheartphoto.com. 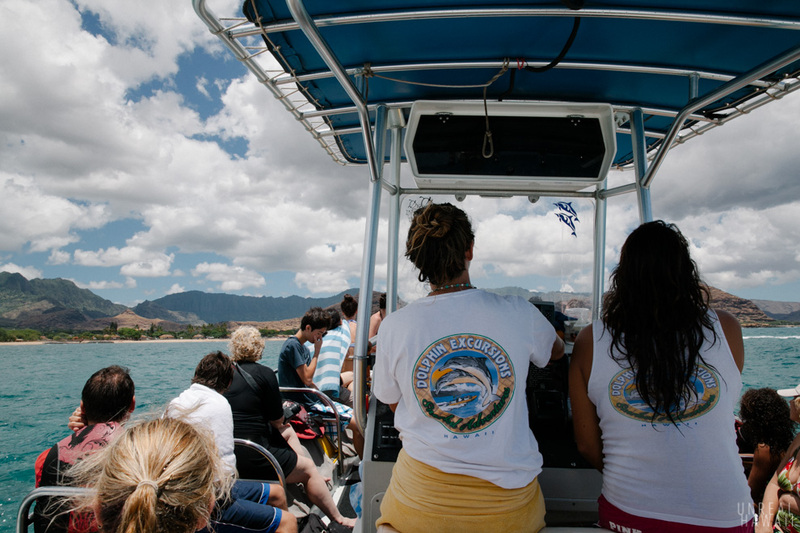 There are a bunch of dolphin tours to choose from on Oahu. The one we went on is called Dolphin Excursions. 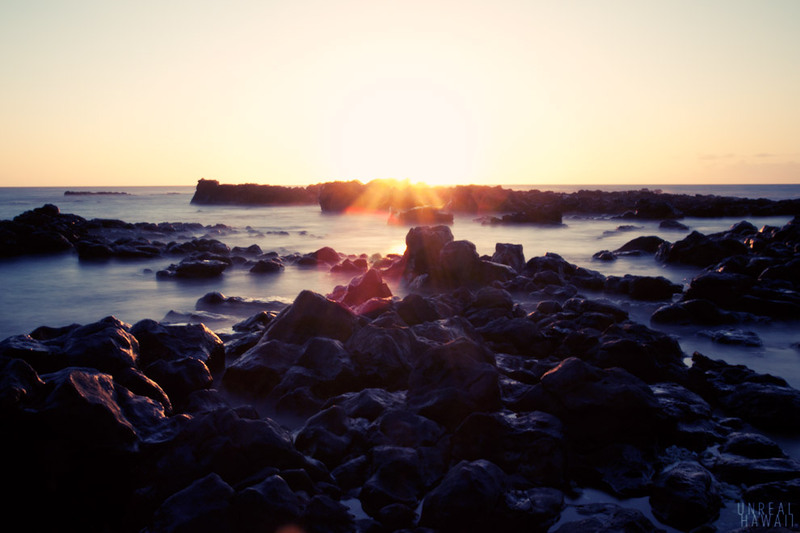 Learn more about Marina Miller photography. Please note that his tour is a bit controversial. If you are an animal activist, this is not the tour for you. Even if you’re not an activist, this tour does come with a bit of guilt. 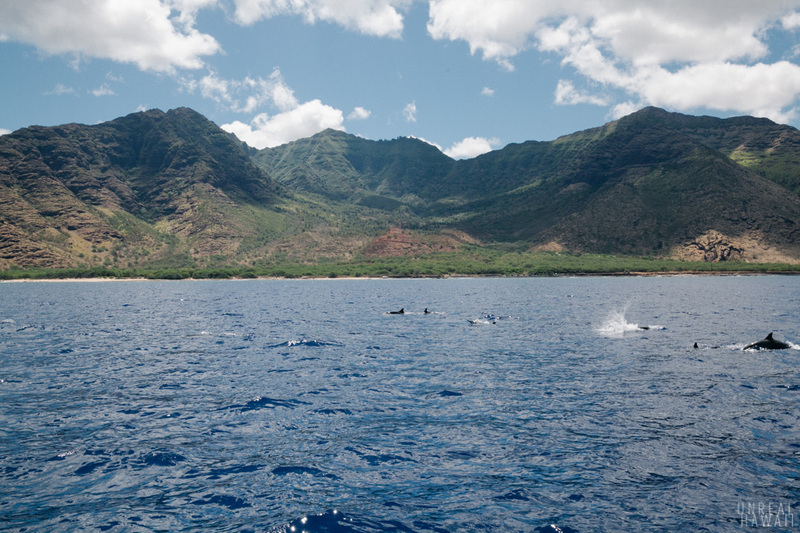 The dolphins seen in these waters are in their resting habitat and tour boats could be a nuisance to them. 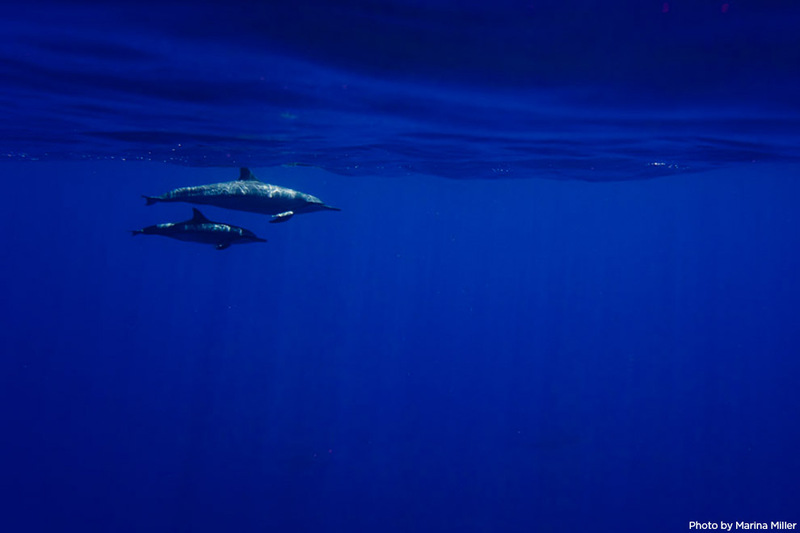 During our tour I saw three other tour boats in the water around the dolphins. This didn’t seem excessive but it was a little weird. I did wonder if the dolphins saw us and our boat as that annoying guy with the weed-whacker that’s trimming the hedges on Saturday morning when you’re trying to sleep in. 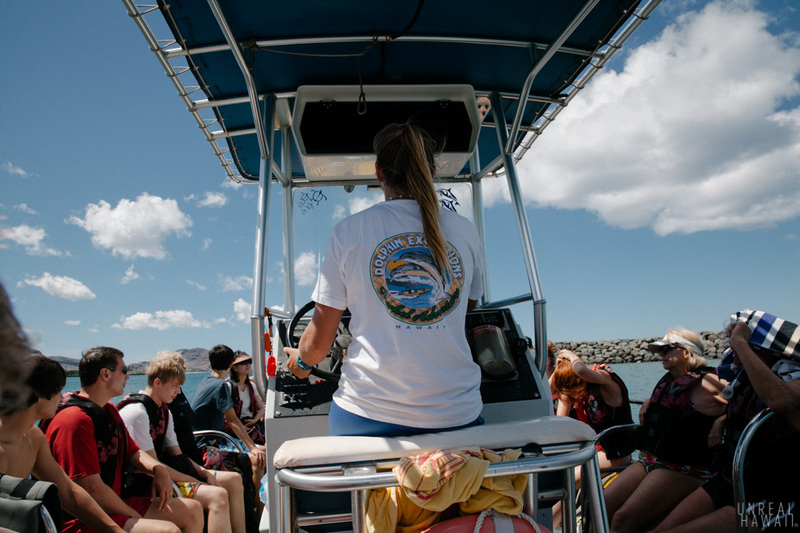 After doing this tour I can definitely see why there are organizations out there trying to create regulations that will protect dolphins from being harassed by tour operators. I personally didn’t feel like our tour was doing anything harmful but I can see how things could get out of hand if the number of tour operators were to increase.